The William Ruckman Philler Papers were classified as part of the Class of 1875 material in the Class Collection (UPT 110) and probably donated to the University in Philler’s lifetime prior to the establishment of the University Archives in 1945. The William Ruckman Philler Papers are arranged in seven series: Alumni Organizations, Athletics, Class of 1875, University of Pennsylvania Events, University of Pennsylvania Publications, and Miscellaneous. The material within each series has been arranged alphabetically. William Ruckman Philler was born in Philadelphia on February 17, 1857 to George Philler and Rebecca Ruckman Philler. He entered the College of the University of Pennsylvania in 1872 as a sophomore and member of the Class of 1875. Philler was a very active and enthusiastic member of the Penn community. As an undergraduate, he was a member of the Phi Kappa Sigma fraternity and the Philomathean Society, where he served as the Society’s Censor. He was also a founding member of both the Athletic Association of the University of Pennsylvania, serving as its treasurer 1873-1875, and the College Boat Club, where he was a member of the four and eight-oared crews. Philler also played on the varsity baseball and varsity cricket teams. Philler’s involvement with Penn athletics did not stop after graduation as he again served as treasurer of the Athletic Association 1882-1883, as secretary of the University Cricket Association in 1880, and remained a lifelong member and supporter of the College Boat Club. Philler earned a B.A. from the College in 1875 and continued his education at the University of Pennsylvania earning an M.A. and LL.B. in 1878. At commencement in June 1878, Philler had the honor of delivering the law oration. Soon after graduation, Philler started working as a manager for the Western Savings Fund Society. In 1886 he started as secretary of the Real Estate Trust Company, a position he held until he retired in 1921. He was also very active within the Merion Cricket Club, serving as its treasurer 1878-1913, vice-president 1913-1935, and president 1935-1936. In June 1885, Philler married Emily Chapman Winsor (1863-1941). Together they had one daughter, Emily Winsor Philler (1886-1946, Mrs. Clement Biddle Wood) and one son, William Winsor Philler (1888-1957). William Winsor Philler also attended the University of Pennsylvania, graduating with a B.S. in 1910. It should be noted that William Ruckman Philler’s brother, George Stanley Philler (1859-1914), also attended the University of Pennsylvania earning a B.A. in 1877 and an M.A. and LL.B. in 1878. Upon the death of Dr. John A. Fell (M-1874) on January 4, 1944, Philler assumed the title of oldest living alumnus of the University of Pennsylvania. He held this title until his own death on March 10, 1944 in Haverford, Pennsylvania, aged 87. The William Ruckman Philler Papers encompass a variety of organizations and events, mostly relating to the University of Pennsylvania. The late-nineteenth and early-twentieth centuries were a time of great change for the University of Pennsylvania; the University moved to its current campus in West Philadelphia, several alumni groups organized and assumed varying degrees of prominence, and athletics gained recognition as an important and worthwhile part of University life. Because of Philler’s direct and lengthy involvement with organizations such as the General Alumni Society (known as Penn Alumni since 2003), the Athletic Association, and the Boat Club during their respective formative years, Philler’s papers may help any researcher looking into the history of these groups. In a more general sense, the Philler papers can be of value to researchers looking at the progression of the University of Pennsylvania as it grew and assumed a role of national prominence, both in academics and athletics. The Alumni Organizations series consists of material generated through Philler’s work with multiple alumni groups. Philler was a member of several different alumni organizations, and the material consists of correspondence, announcements, and documents generated through the planning of meetings and dinners. Most of this material comes from the General Alumni Society, and for this reason it is included within its own sub-series. The General Alumni Society came into existence in the last decade if the nineteenth century and became the most prominent of the University of Pennsylvania alumni organizations. 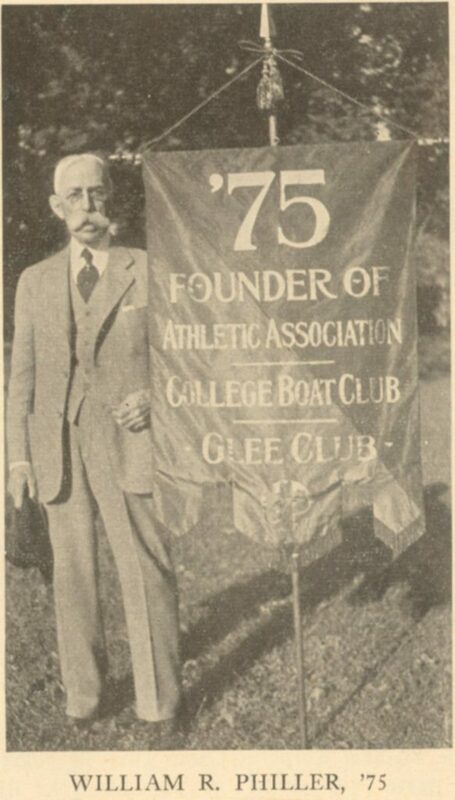 The General Alumni Society published a number of periodicals; a few issues of these periodicals are included here as they contain articles specifically relating to alumni functions, or because they contain articles on subjects Philler felt strongly about, such as the Athletic Association or the College Boat Club. Philler was a lifelong fan of athletics at the University of Pennsylvania. In the series called Athletics there are several official programs, posters, and tickets from various events that were collected over the years. Philler was a founding member of the Athletic Association of the University of Pennsylvania, the College Boat Club of the University of Pennsylvania, and the University of Pennsylvania Cricket Association. Each of these organizations have been listed in a sub-series and in addition to similar material found in the general Athletics series, they contain correspondence that discusses the formation of the respective groups. Philler was an officer of the Class of 1875 until his death. As an officer he planned reunions and kept track of his fellow members of the class. He paid special attention to the gentlemen he called his closest friends from his university days: Edward B. Gleason, Effingham B. Morris, John C. Sherlock, and John W. Townsend. The material generated from Philler’s work as a class officer is represented in the series called Class of 1875. There is also a small sub-series of materials that date to Philler’s years in the College. This sub-series consists of papers, speeches, and “standing reports” or semester evaluations. The series called University of Pennsylvania Events contains programs, tickets, and other ephemera from University events that Philler attended. This series also contains material that deals with the planning of the bicentennial celebration of the University in 1940 as Philler was a member of the Bicentennial Celebration committee and helped to plan the event. The official program of the celebration, called the Bicentennial Celebrator, is also included here. The University of Pennsylvania Publications series contains items that were published by the University. This includes several years of the annual yearbook which is called The Record, a significant run of the University Catalogue, and a handful of issues of the University Magazine. Finally there are two series of Miscellaneous materials which have been divided into those that are from the University of Pennsylvania or at least related to the University in some way, including information about the Glee Club, the University Orchestra, and the fraternity that Philler was a member of, Phi Kappa Sigma. All other materials were grouped into the Non-University of Pennsylvania sub-series and contain material from anything that Philler was involved in that did not relate to the University of Pennsylvania, such as the Merion Cricket Club, the Law Academy of Philadelphia, the Philadelphia Fencing and Sparring Club, et cetera. Pennsylvania Gazette, Supplement for Class Officers, n.d.
Book fragment, “Satires of Horace”, n.d.
Paper: untitled geology paper, n.d. Memorabilia: pins and ribbons, n.d.